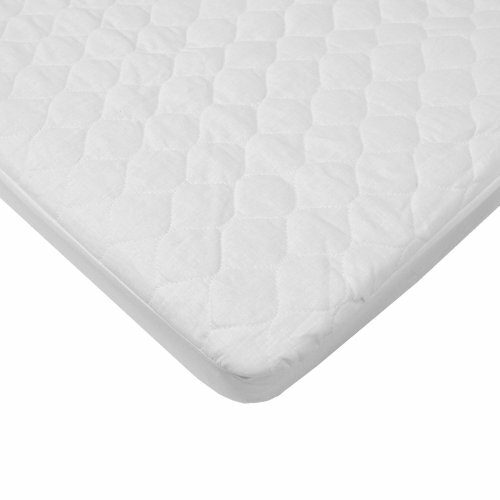 The waterproof fitted bassinet size mattress cover has a top layer of 100% cotton all over quilted pattern for baby's comfort. The middle layer is made of soft polyester filler and the back is made of 100% vinyl. The cover measures 15" X 33" x 4". Machine wash warm with like colors and use non clorine bleach when needed. Top: 100% Cotton; Middle: 100% Polyester; Back: Waterproof 100% Vinyl. Measures 15 inches x 33 inches x 4 inches. Fits up to 2" Bassinet mattress.